Visibility, Control, Choice, Speed, and Agility. EDB Postgres Ark is the DBaaS infrastructure that makes it easy for app developers to build, deploy and maintain applications on multiple cloud infrastructures including: Amazon EC2, OpenStack and Microsoft Azure. 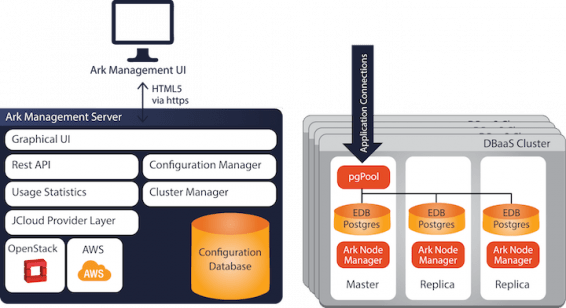 EDB Postgres Ark is a DBaaS for hybrid cloud deployments of Postgres to public and private clouds; on Amazon, OpenStack, and other deployment platforms. EDB Postgres Ark provides a unified UI (graphical and API) to control and manage deployments across multiple platforms from a single management console that you manage and control. EDB Postgres Ark deployments are highly available, have integrated disaster recovery, cross-platform replication (database, provider and geo), self healing capabilities and with EDB Postgres make migrations a snap. EDB Postgres Ark gives IT managers the ideal combination of deployment flexibility combined with centralized control and monitoring while providing developers point and click simplicity, flexibility and speed when developing and deploying applications.